Alongside a rising price trend in EU power markets, onshore wind and PV generators widely secured higher wholesale revenues in 2018 compared to previous years. This, combined with ever lower project costs, makes subsidy-free renewable investments more and more attractive in an increasing number of European countries. Our free market report maps the status quo for 25 countries and explains the dynamics behind it. All across Europe, wholesale power markets continued to see rising price levels in the past year. The revitalization of the EU-ETS with increased CO2-prices combined with rising fuel costs and declining coal and nuclear capacities led to jumps in base prices of around 10€/MWh. Reduced availability of hydro units with low marginal cost caused by an exceptionally dry and hot summer also added to this effect. The trend in power price development was also reflected in the average capture prices of renewables. But capture rates of PV and onshore wind can differ substantially from average prices. This is driven by the technology and project specific generation profile as well as the penetration rate. The more capacity of either technology is available, the stronger it depresses the marginal price of typical production periods due to similar production profiles. This adverse impact is referred to as the cannibalization effect. PV usually generates during peak hours with higher demand and therefore higher prices. But in markets with high penetration rates (e.g. Italy or Germany) capture prices have already dropped well below average prices. Thus, country-wise variation in observed capture prices results from different overall price levels and the rate of penetration already reached within the respective market. The map below shows capture prices of PV in 2018. In 2018 PV capture prices ranged from 63 €/MWh in Poland with very limited PV installations and high power prices to date, to only around 43 €/MWh in Germany, the direct neighbor country, which has one of the highest penetration rates for PV, and a comparatively moderate base price level. 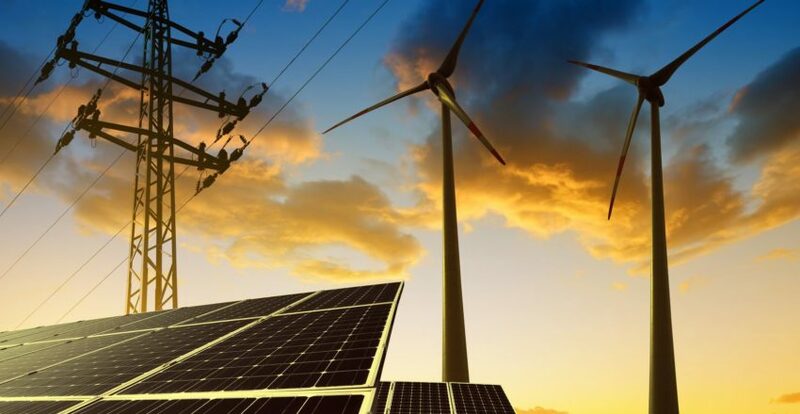 Central European power markets traditionally show the lowest capture prices, due to high shares of renewables in combination with still significant conventional generation with low marginal Costs. Accordingly, Spain will see the first subsidy-free PV plant commissioned shortly. Several gigawatts of an overall pipeline of around 25 GW secured long-term PPAs already. Other southern countries, such as Italy, provide similarly attractive irradiation as well as wholesale price levels, but have less extensive pipelines of announced projects and thus even more room for beneficial investment. 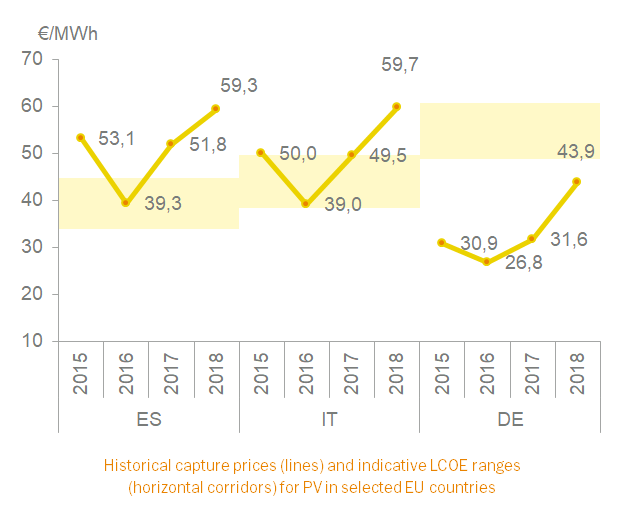 Also Portugal, Greece and France showed capture prices well above LCOE in 2018 (see full enervis market parity report for more insights). In Germany, a number of PV merchant projects have been recently announced, though historically market parity was not reached by 2018. This proves that market players are taking into account expectations of future power prices. Current futures quotations for the German bidding zone lie roughly 10 €/MWh above last years’ base, thus making unsubsidized installations potentially attractive despite lower full load Hours. The future development of capture prices is determined by several impact factors. While rising CO2-prices and less conventional baseload generation are likely to keep prices comparably high in the near term, increasing penetration of ever cheaper renewables may counteract this trend. Later entrants with lower cost will also particularly challenge the viability of already existing merchant projects. Efforts to increase inter-zonal trade might lightly ease the regional concentration of wind or PV and the related cannibalization effects. Where are other European countries located in the market parity scale, how do capture rates already differ, and what is the situation for onshore wind projects? To see the full analysis for 25 countries click here. Register for our webinar on 26th of February 2019 to be walked through the report’s main results. If you like to learn more about this event, you are welcome to give us a call or send an e-mail. We look forward to hearing from you.